Congratulations to Joe Weathersby and Doug Houston. Last month at Winter Camp they both completed their marksmanship requirement to become candidates for Colonel in the Texas Army. Both had been practicing prior to the event, and it showed. The marksmanship requirement is that a shooter place five consecutive shots into a 9 inch pie plate at 50 yards, using a black powder muzzleloader with fixed sights and round lead balls. It is not an easy feat, but you would have thought it was a cake-walk if you had watched them shoot. They did a great job! 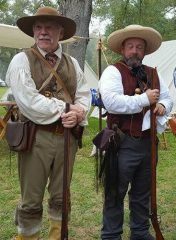 In addition to the marksmanship requirement, a member in good standing with The Texas Army can apply for candidacy as a Colonel once they have completed a minimum of 5 qualifying events, and demonstrate an excellence in the knowledge of Texas history. Upon review and acceptance, candidates commissions are signed by the Governor of Texas and presented each year at the San Jacinto monument during the commemoration of the Battle of San Jacinto. Doug and Joe join Howard Rose (who qualified late last year) as our current group of candidates. Brigadier General Emmitte will be facilitating 2 additional shooting days in hopes of getting more people qualified before we make a visit to the Capital. Who will be our next candidates?